KINGSTON, Jun 2 2015 (IPS) - For Jamaicans like Roxan Brown, the Caribbean nation’s International Monetary Fund (IMF) successes don’t mean a thing. Seven consecutive tests have been passed but still, the mother of two can’t find work and relies instead on the kindness of friends and family. The 32-year-old has been in several government-sponsored training programmes and has even filed for help under the Programme of Advancement Through Health and Education (PATH), a safety net set up to assist the poor. But she fails to qualify and can’t understand why. In the long history of Jamaica's on-again off-again relationship with the IMF, it is the poorest of this nation’s 2.8 million people who suffer the heaviest burden. With most earnings going to pay loans, there is nothing left for government assistance. The single mother spends each day making phone calls, sending messages and making as many trips as she can afford, hopeful that one will result in a job. Roxan is desperate to help her son who graduated high school last year and has qualified for college. Her daughter is in secondary school and is preparing to sit exams. 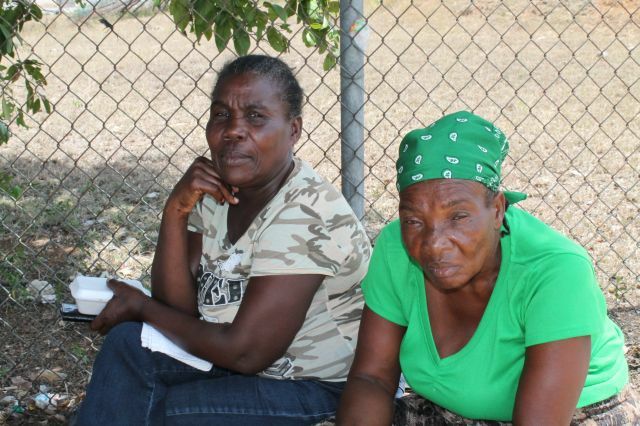 Several miles away in the south coast village of Denbigh, the two elderly women sitting outside the May Pen Health Centre tell their stories of hardship. Five days a week, they scratch out a meagre living selling a few sweets, biscuits, some bottled water, drinks and fruits to make ends meet. Neither have pensions and none qualify for even the basic of government assistance under PATH. Seventy-year old Elise Young’s small box of mixed sweets and biscuits and the plastic bucket containing some ice and a handful of drinks is hardy enough to pay the 18-dollar electricity bill each month and buy food. “It’s very rough but I still have to live,” she said, noting that her daughter, who generally helps out with a few dollars a week, is now unemployed. 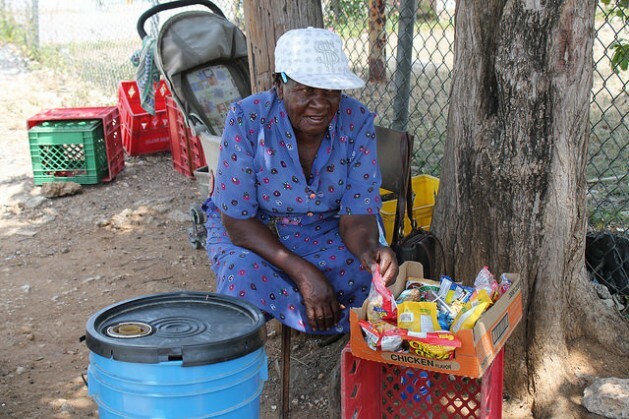 Next to her sits Iona Samuels, an on-again-off again vendor who sells a few dozen oranges and bananas to make ends meet. Iona is lucky: she lives rent-free, house-sitting for a friend who lives in Canada. Her on-again off-again business is due to the many times she is unable to restock the plastic crates that serve as her stall because she uses all the cash to buy food and pay water and light bills. “Sometime I buy two dozen oranges and two dozen bananas and I only sell half. Sometimes I don’t make a profit because I have to sell them for what I pay for them and I have to eat and pay the bills,” she explains. Iona admits that advancing age has slowed her ability to do more strenuous work. She is concerned that government has no programmes for “the poor and vulnerable” people like her. The good fortune that allows Iona to live rent-free also goes against her in her quest for government assistance with her daily expenses. “I live in a house that is fully furnished, so I am unable to qualify for anything. There is no consideration that the house is not mine. It is my friend’s house. There is a gas stove, and a television so I don’t qualify for help,” Iona complains. In the long history of Jamaica’s on-again off-again relationship with the IMF, it is the poorest of this nation’s 2.8 million people who suffer the heaviest burden. With most earnings going to pay loans, there is nothing left for government assistance. Media reports cite information from the U.S.-based Centre for Economic Policy and Research, which states that three years into its latest IMF programming, Jamaica’s economy is suffocating, struggling to reach its current quarterly growth rate of between 0.1 and 0.5 percent. After 20 years of improvement to the country’s poverty rate, the number of Jamaicans living below the poverty line has ballooned in recent years from 9.9 percent in 2007, to 12.3 in 2008, 16.5 percent in 2009 and 19.9 percent in 2012. And if the 2014 research by the local Adventist Church is correct, today there are 1.1 million Jamaicans living in poverty. The most pressing problem is the country’s debt, which the government readily admits has severely hampered its economic growth. According to the World Bank website, Jamaica’s debt to GDP (Gross Domestic Product) ratio, estimated at 140 percent at the end of March 2015, is among the highest in the developing world. For the Portia Simpson Miller-led administration that won the 2011 general elections on a ticket of being a friend of the poor, there is not much caring left, at least not under the IMF. The Planning Institute of Jamaica (PIOJ) reports that while the IMF programme is necessary, it is still not sufficient to unlock the kind of growth necessary to boost the economy and grow jobs. According to the PIOJ, “Economic recovery remains fragile” even as the country successfully completed the IMF assessments with improvements in most macro-economic indicators and outlook for growth. Simply put, Jamaica continues to spend far more than it earns. But while individual sectors continue to show improvements, manufacturers and the international community blame the cost of fuel, high energy costs and crime as impediments to growth. Last year, Jamaica paid the IMF over 136 million dollars more than it received, and the country still owes the World Bank and Inter-American Development Bank over 650 million dollars through 2018. Even so, government continues to struggle to maintain social gains such as free healthcare and free primary and secondary education. There are those who believe government is not doing enough to create jobs and that the available jobs are going to government supporters. There are those who blame the private sector, and they in turn point to a depreciating dollar, high cost of fuel and high-energy costs. And of course there is crime. With unemployment rate at an alarming 14.2 percent and youth unemployment estimated at twice the national rate, things are not looking good for Roxan, who falls into that category. The IMF financial plans always create huge inequality and act like a cancer sucking the life out of developing countries. As someone who supports sovereign money and the ability of governments to print and control their own currencies, it is deeply depressing to read stories like this. The idea that governments continue to line up to ask for “help” from the IMF and are repeatedly suckered into borrowing their way out debt is proof enough of how corrupt this world has become. Banking is not a force for good as it is presently operated. I happen to live in the UK the centre of much of this banking corruption, but our politics is not shining any light on these areas and our education system doesn’t even recognise the need for proper financial education and awareness – God forbid.